Bangkok gains its reputation for its religious atmosphere and prolonged history. Along with the river, it spots a number of historical buildings. The city is a live shrine treasure where most of the tourist attractions are connected with temples. 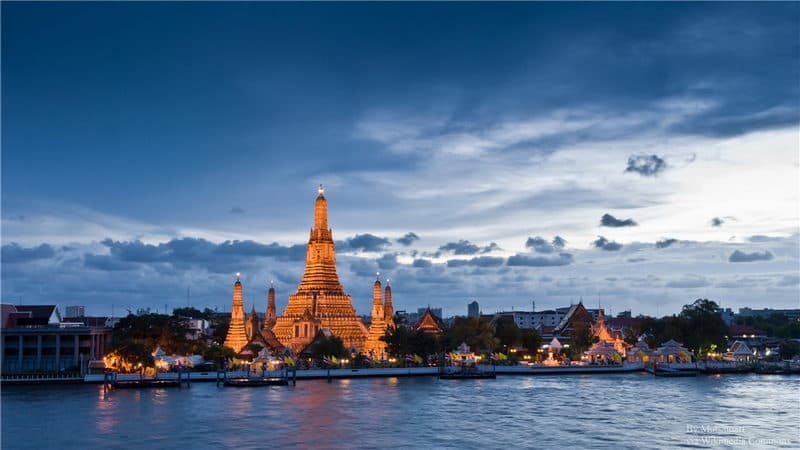 The most famous attractions in Bangkok are the Grand Palace, Wat Phra Kae and Wat Pho. The Grand Palace is a complex of royal buildings at the heart of Bangkok. It has been the official residents of the Kings of Siam and long been the typical loyal resident of Thailand since then. 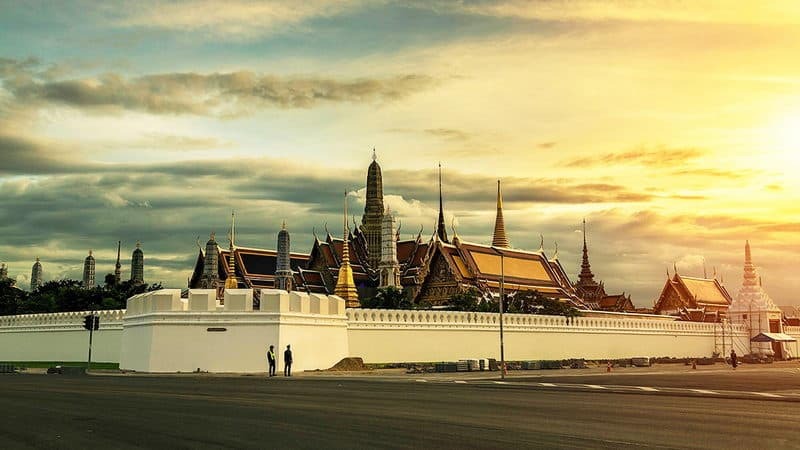 Back to Chao Phraya River, the palace covers an area of over 260,000 square meters with wall surrounded. Within the wall is the representative Siam architecture and among which the most famous are four palaces with distinctive characters. Preserved, and majestic considerable, it expresses a glorious of ancient royal picture to tourists. 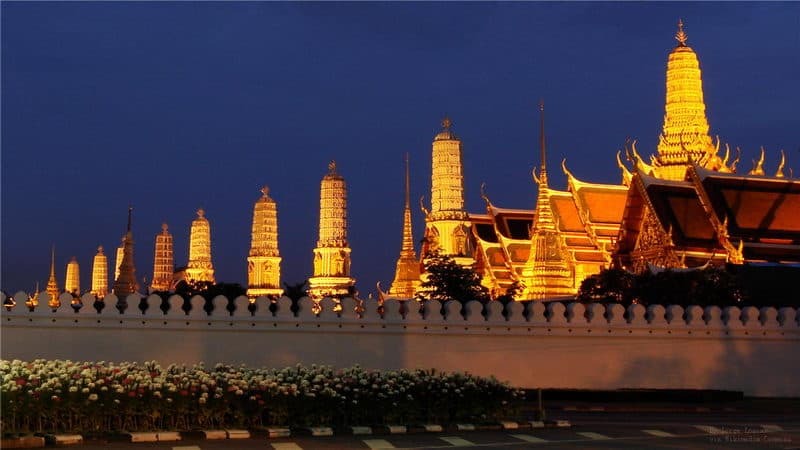 Located in the northeast part of the Grand Palace, the Wat Phra Kaew is one of the most remarkable example of Thai temples. Inside the Hindu shrine of the god, there is the dark-green Emerald Buddha which is a religio-political symbol and the protective image of Thailand. In the Thai history and legend, emerald Buddha brings prosperity and peace to where it resides. Every summer, winter and rainy seasons, the King performs a special ritual to bless the country—changing the cloak around the status. Wandering around the palace, tourists have a good chance to appreciate the exquisite wall painting. All the pictures' themes are from traditional Indian literature Ramayana. Apart from that, the splendid appearance and glittery decoration of the buildings are also extremely impressive. 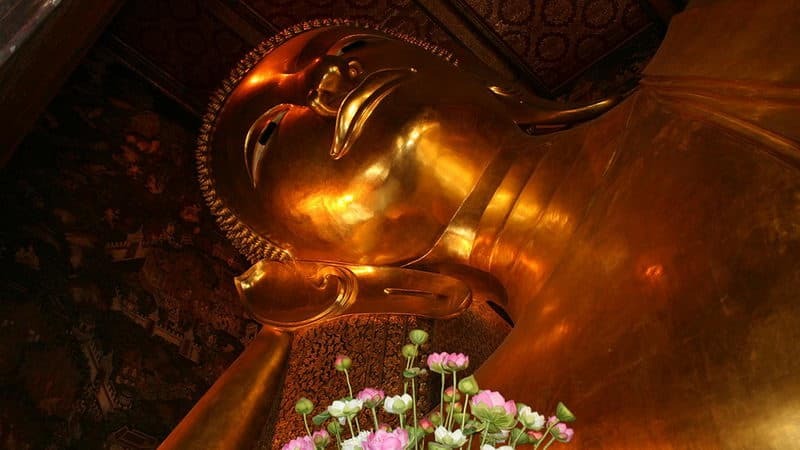 As the most ancient temple in Thailand, The Wat Pho neighbors to the Grand Palace, and at the same time, it also reserves the biggest reclining Buddha. With the whole length of 46 meters and the foot length of 5 meters, the reclining Buddha boast the largest reclining Buddha around the world, all covering with gold and its pedestal is decorated with 108 auspicious patterns. The temple gains such a high reputation, domestically and externally, not only for the fame of largest reclining Buddha but also for its majority of statuses and stupas. It is made up of 99 stupas of which 71 are surpass 7 meters and 394 Buddhist figures in about 80.000 square meters. Distance from Bangkok city center: the three above are at the Grand Palace District, very close to the city center. It is a good idea to buy a map of Bangkok in a local bookstore as a guide if you want to travel the city with no guide. Wat Arun lays on the west bank of the Pian, in the close distance of the Grand Palace. The temple derives its name from the Hindu god Aruna, often personified as the radiations of the rising sun, so it is also called the Temple of Dawn. It has existed since at least 17th century and it is the biggest Mahayana stupa in Thailand. You can easily take a river boat from one side to the other for only 3 baht. Almost every tourist has a visit to a floating market in mind on his first trip to Bangkok. 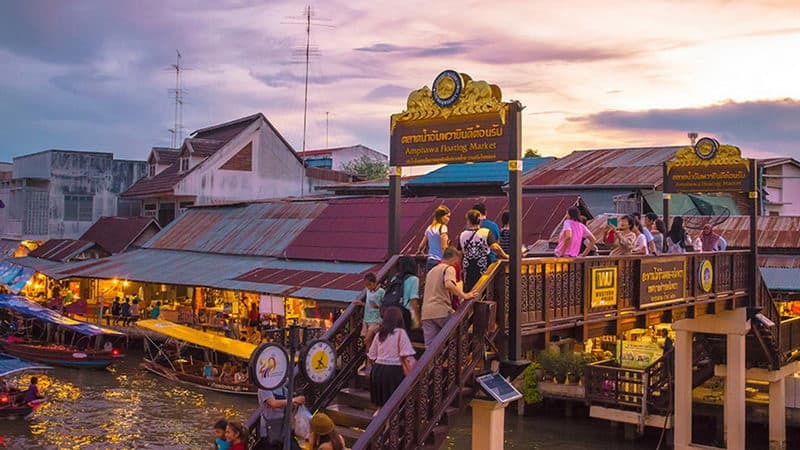 Actually, there are more than 5 floating markets in Bangkok among which the Amphawa Floating Market is the most attractive. A branch of the Mae Klong River floats through the market and many little wooden house neatly lined up alone the canal, selling souvenirs and a lot of charming snacks and sweets. It opens at 15 p.m.-20 p.m. every Friday, Saturday and Sunday so you can arrive around 16 p.m. so you would not miss the amazing little temple across the river, and at the same time have an early seafood lunch on the river banks and get a little long tail boat cruise. The Erawan Shrine features four heads and four pairs of arms towards different sides. 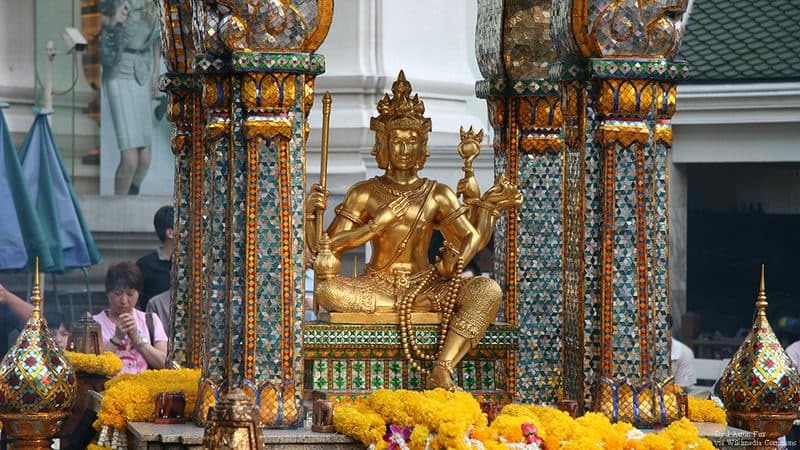 Housed in the city center of Bangkok, it is a well-known statue of Hindu god: creation Lord Brahma. Whenever you arrive, you will always meet a great crowd of believers there. More attractive thing is the performance by resident Thai dance troupes which are often operated in festivals by worshippers in return for their wishes coming true. Cover shoulders, legs and stomach when visiting temples in Thailand especially in the Grand Palace, otherwise you may be rejected. It is easy to rent a sari near the Grand Palace. When offering prayers to Buddha kneel down with feet pointing away from Buddha. At any time, pointing Buddha with your foot is prohibited. Remove shoes when entering any of temples.